My weakness is banana bread. Serious weakness. I have been doing this two day "fast" where I eat fruits and veggies 2 days a week (inspired from my sister's 30 day clean eating challenge). Well, I do them on Monday and Thursday. So yesterday I was going through all my fruit and noticed the bananas were overripe. And if you don't make a lot of banana bread, like myself, then you might not realize that if you let the bread sit for a day, the vanilla and the banana flavors fuse together magically over the time while they sit there, waiting to be devoured enjoyed. Needless to say, I made the bread and let it sit so I could enjoy it for my breakfast this morning. 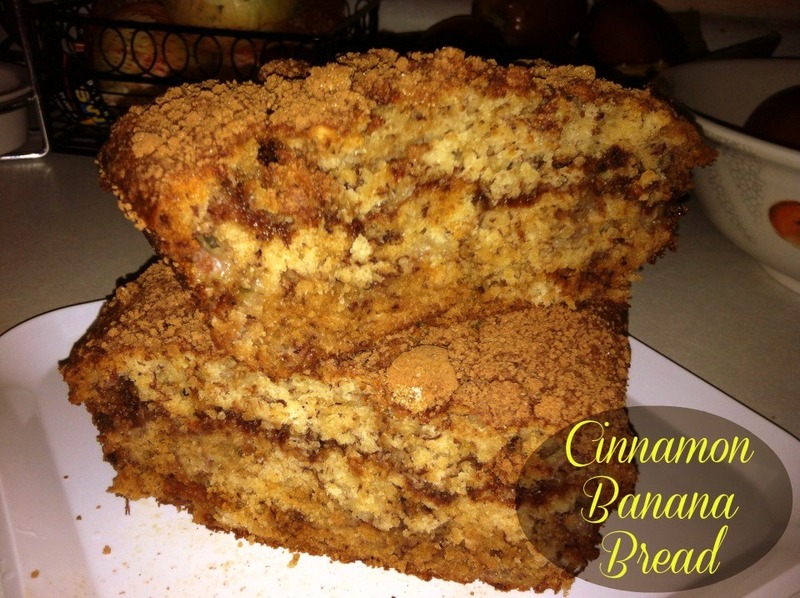 I typically make a streusel topping for my banana bread or muffins, but opted just for a sugar/cinnamon topping instead, and made a bit more than normal to add a little layer in the middle. You can see the cinnamon stripe in the bread. In a mixing bowl, add the melted butter, sugar, vanilla, and the egg to the mashed bananas. Sprinkle the salt and baking soda over the banana mixture. Fold in the flour, mixing just enough so no streaks of flour remain. In a small bowl mix together the brown sugar and ground or cinnamon. Spray a bread pan with non-stick spray and spread 2/3 of the batter into the pan. Sprinkle with 2/3 of the sugar/cinnamon mixture. Add the remaining batter to the pan. Sprinkle with the remaining sugar/cinnamon mixture. Bake for 55-60 minutes, or until toothpick inserted in comes out clean.